In a sign that the Federal Reserve is still on track to raise interest rates, real (inflation-adjusted) M0 money supply declined 8.8% in September vs. the year-earlier level—the steepest annual slide since 1948, based on monthly data. Red ink for the annual trend in real M0, also known as the monetary base and high-powered money, has persisted in every monthly update this year to date save February. Taken at face value, that’s an ominous sign for the business cycle, although the outlook may be different this time. Historically, negative year-over-year changes for real M0 have been accompanied by recessions, including the 2008-2009 downturn. As the central bank tightens monetary policy, economic growth suffers. The question is whether the analysis applies this time? One reason for thinking that the negative M0 trend isn’t the high-risk event that it has been in the past is the extraordinarily high growth rate for high-powered money that’s prevailed in recent years. In other words, the Fed is in the process of mopping up a degree of the excess liquidity that been pumped into the system as the economy has returned to something approximating normality. As a result, the negative trend in M0 this year—the longest consecutive run of red ink since 2007, which preceded the Great Recession—may not be a prelude to a new downturn this time, at least not for the immediate future. Why? Because negative M0 growth in the current climate still leaves a relatively high amount of liquidity in the system in the wake of the Fed’s unusually aggressive monetary policy in recent years. That, at least, is the optimistic spin on interpreting the recent M0 data. The alternative narrative is that the contraction in the monetary base is a) premature as a policy decision; b) laying the groundwork for the next recession. Perhaps, but predicting a new downturn isn’t expected to find support in next week’s third-quarter GDP report, or so it seems via the Atlanta Fed’s current nowcast. Q3 economic growth is projected to rise 1.9% (seasonally adjusted annual rate), according to the current GDPNow estimate (as of Oct. 14). That’s a moderately higher gain compared with the sluggish growth in each of the previous three quarters. 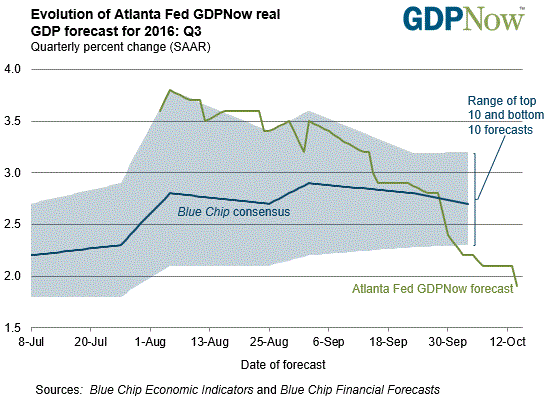 But there’s a glitch: the GDPNow estimates for Q3 have been sliding lately. Another dip in today’s scheduled estimate would raise new questions about the near-term outlook for the macro trend. 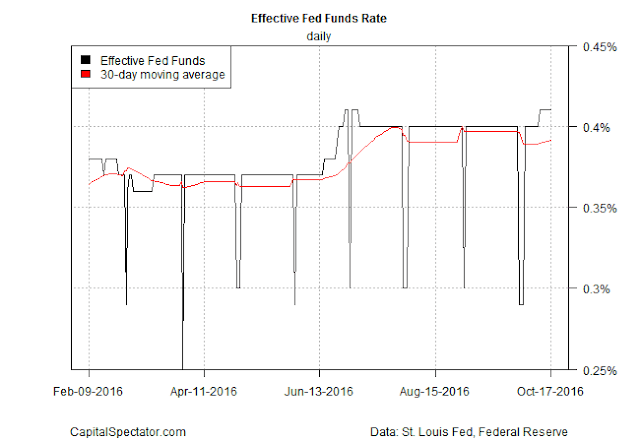 Nonetheless, Fed funds futures are currently pricing in a roughly 65% probability (as of Oct. 18) that the Fed will raise interest rates at the December FOMC meeting, based on CME data. Next month’s meeting (Nov 2), by comparison, is expected to be a non-event by leaving rates unchanged. 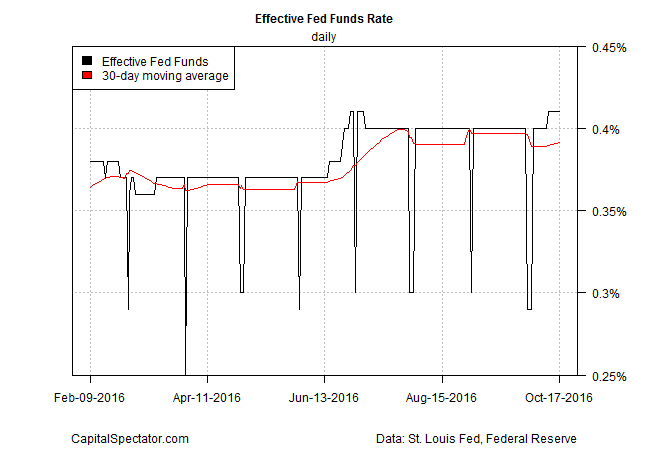 Meantime, the effective Fed funds rate continues to hold steady at 0.41% (as of Oct. 17), a three-month high that’s also the highest rate since the last recession. 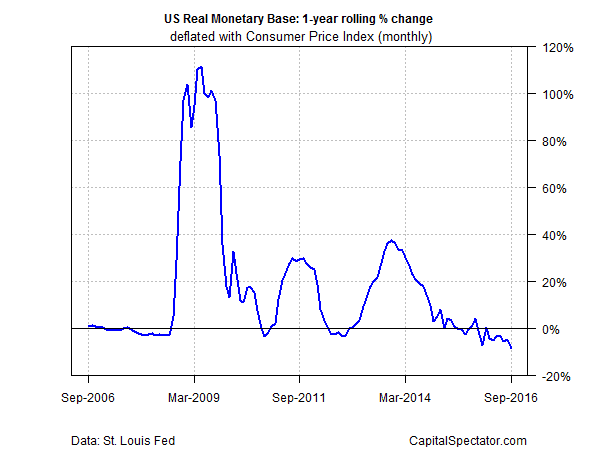 Here, too, is another clue for thinking that the Fed may be gearing up for a rate hike. It’s unclear, however, if the Treasury market is on board with the Fed’s plans. 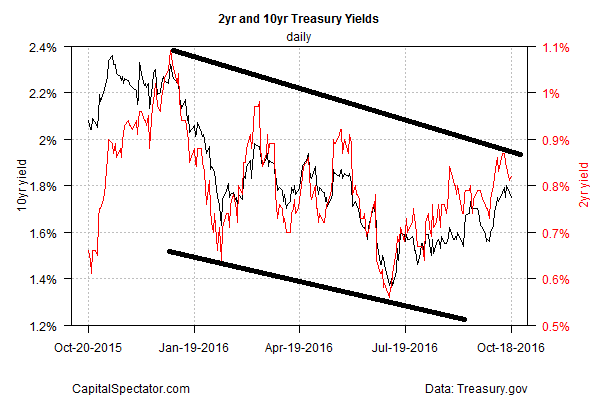 Although the policy sensitive 2-year and benchmark 10-year yields have trended higher since the summer, the increase has stumbled lately, leaving this year’s downtrend intact at the moment. It appears that while the Fed is leaning toward squeezing policy before the year is out, the Treasury market still has doubts. That leaves us with the question: Which side will blink first? The answer, as always, resides in the upcoming economic data. Based on what we know, however, there’s ammunition for the doves and the hawks in the monetary arena. Although recession risk remains low at the moment, based on the numbers in hand, it’s also clear that economic growth is still subpar and so the argument in favor of a new rate hike is wobbly at best. Until (or if) we see substantially firmer numbers in the macro updates ahead, it’s reasonable to assume that the Fed may be inclined to revert to form by continuing to delay the next rate hike to some unknown date in the future.